You can’t always see air pollution in a photograph. In the previous post I counted down the industrial facilities that are the 10 largest GHG emitters in Missouri, providing photos. Carbon dioxide, the main greenhouse gas, is colorless and odorless: you can’t see it. What, then, do the photos I posted show? Here are a few more photos and a discussion of what can and can’t be seen in them. The Clean Air Act requires the EPA to set standards for atmospheric concentrations of 6 common air pollutants (aka criteria air pollutants). They are ozone, sulfur dioxide, nitrous oxide, carbon monoxide, and two classes of particulates: particulates less than 2.5 micrometers in size (PM2.5), and those between 2.5 and 10 micrometers (PM10). (See here.) They are by no means the only air pollutants emitted by large industrial plants. 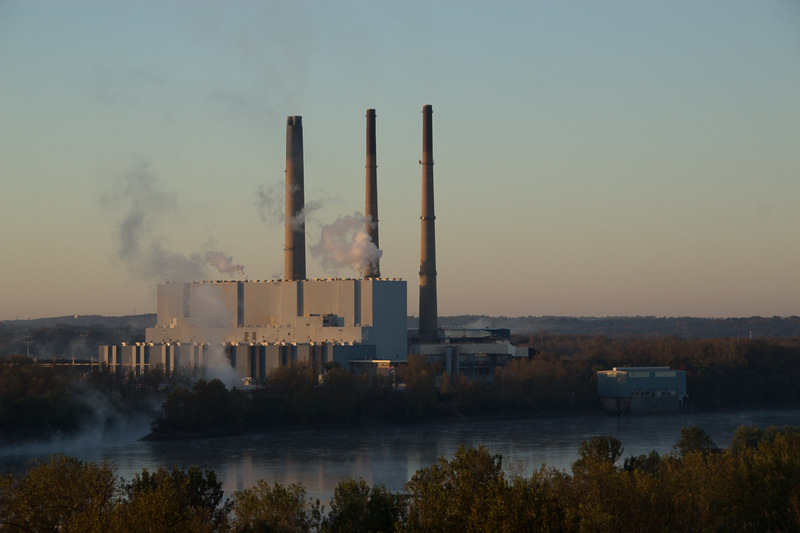 Among the 10 largest GHG emitters in Missouri, other pollutants include carbon dioxide (of course!) plus as many as 15-20 toxic compounds, most commonly heavy metals like lead and mercury (EPA TRI Explorer). Heavy metals are contained in coal and released when it is burned, and are toxic even in small amounts. At least 5 of these pollutants are colorless gases: ozone, sulfur dioxide, nitrous oxide, carbon monoxide, and carbon dioxide. You can’t see them in the plume emitted by an industrial facility (or by your car, for that matter), they are invisible. The remaining compounds are contained in escaping particulates. Figure 1. The Sioux Energy Center Before Dawn on a Winter Day. Photo by John May. Figure 2. Mississippi Lime Co. Ste. Genevieve Plant on a Winter Morning. Photo by John May. Figure 1 and Figure 2 show the Sioux Energy Center and the Mississippi Lime Company Ste. Genevieve Plant. The photos show dramatic white plumes belching from the chimneys of these two plants. Those white plumes sure are dramatic, but they are not the problem. They are mostly steam – water vapor. It condenses when it hits the air on a cold morning, forming dramatic white clouds. The dark parts of the cloud are simply shadow where the cloud has become thick enough to block the sun. The problem is what is hidden inside the white plume. That is where the air pollutants are. In addition, if you look at the buildings in Figure 2, you can see a gray haze. Those are particulates. I don’t know if they are PM2.5, PM10, or even larger particles, or perhaps a combination of all 3. While taking the photo in Figure 2, I noticed a definite rotten-egg smell. That is usually caused by sulfur dioxide, and it suggests that sulfur dioxide was being emitted by the plant. You can’t see it, however, it is colorless. Figure 3. The Labadie Energy Center on a Spring Morning. Photo by John May. Figure 4. The Labadie Energy Center at Dawn on a Fall Morning. Photo by John May. Figure 3 shows the Labadie Energy Center on a warm day in May. No billowing clouds of steam are visible, it wasn’t cold enough to condense them. With the naked eye you could barely make out a slight plume coming from the chimneys. By using a polarizing filter, I could make it just a bit more obvious. 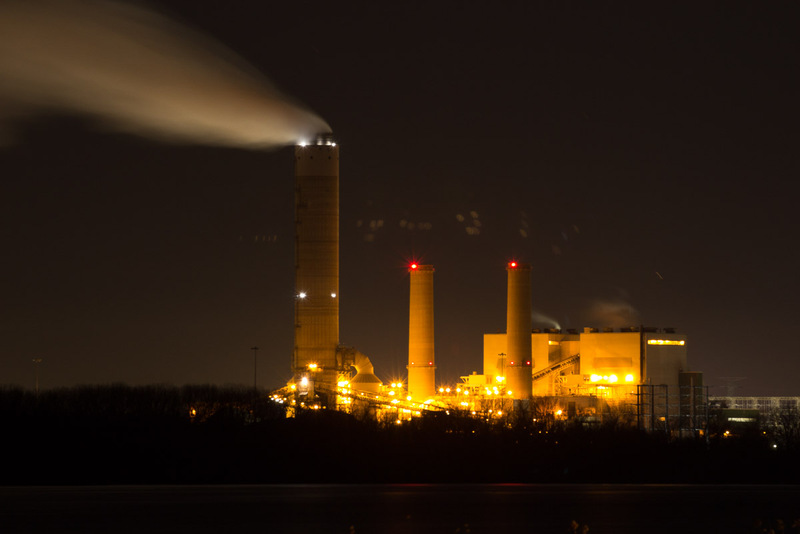 Here we have a photo of the real pollution being emitted by this power plant. I think it is probably fly ash – those PM2.5 and PM10 particles the EPA tracks. 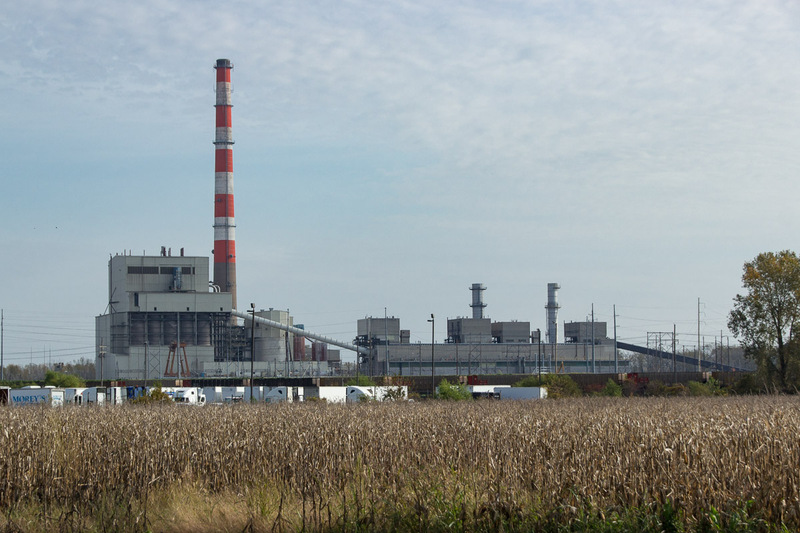 Figure 4 is a photo of the Labadie Energy Center on an October morning. If you look very hard, you can see a slight discoloration above the stacks, but man, is it hard to see! 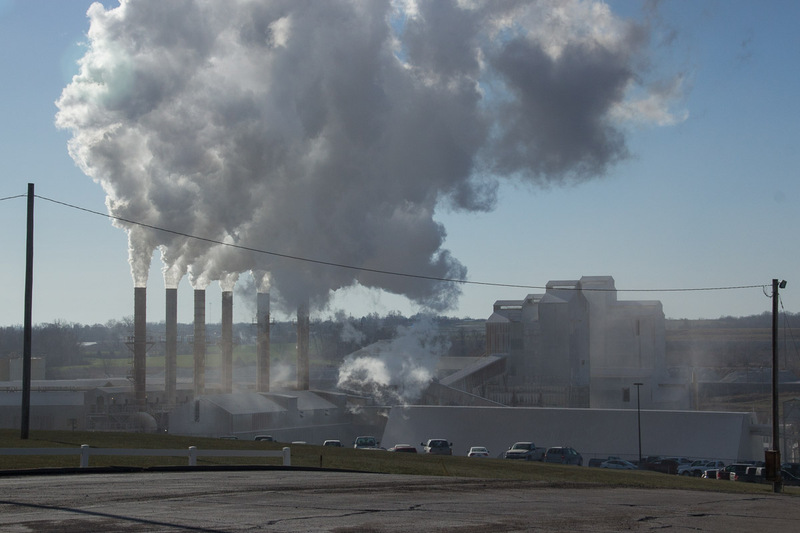 Unless the emissions are backlighted, or unless the photo is enhanced, it is very, very difficult to see the pollution that belches forth from these facilities. Figure 5. The Thomas Hill Energy Center at Dusk on a Fall Day. Photo by John May. Figure 6. The Hawthorn Plant on a Fall Day. Photo by John May. Figure 5 shows the Thomas Hill Power Plant and Figure 6 shows the Hawthorne Plant. The plants were pumping out electricity, which means the boilers were burning, but no plume is visible above the chimneys. The conditions just weren’t right to be able to see it. 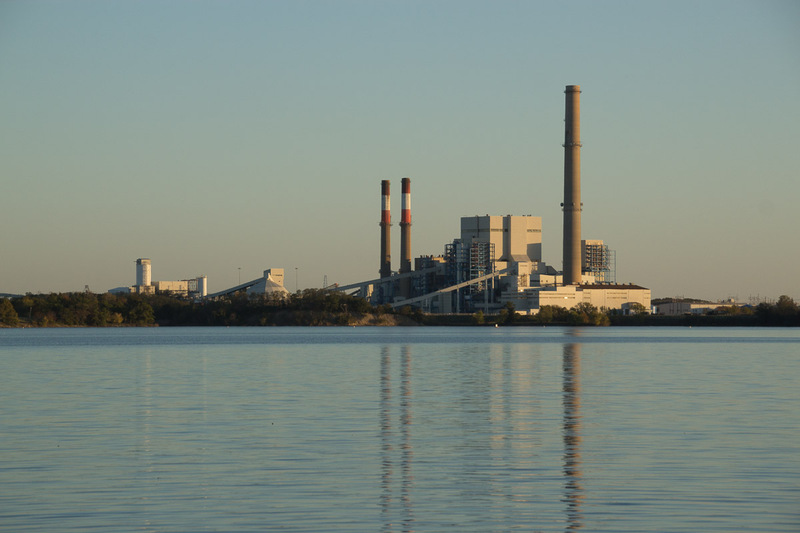 If you look at all the photos of power plants, you can see that they share one characteristic: a tall chimney. The one at New Madrid is 800 ft. tall, Iatan, Rush Island, and Labadie have stacks that are 700 ft. tall, Thomas Hill’s stack is 620 ft. tall, the Sioux Energy Center stack is 603 ft. tall, and so forth. Tall chimneys like this are expensive, so there is a reason for them. Most of the pollutants emitted out of the chimneys are poisonous. If they were emitted at ground level, they would blow with the wind and cause harm. In addition, almost all of them are regulated by the EPA. 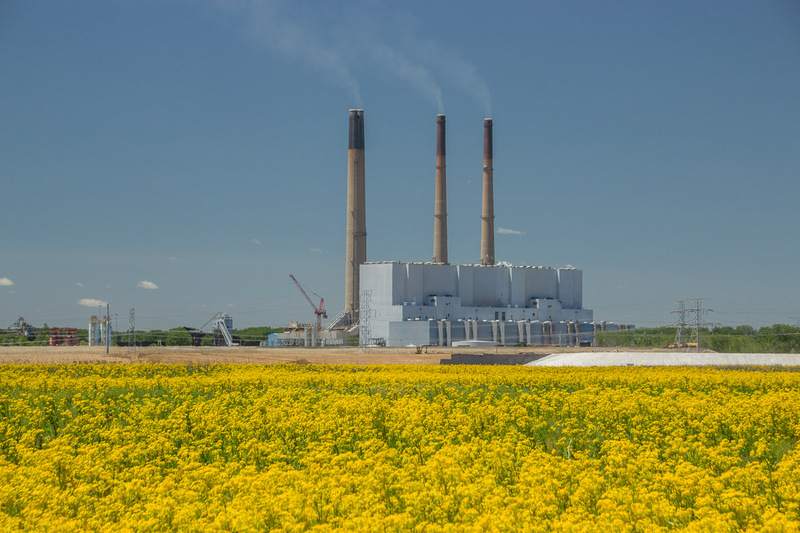 If the chimneys were less tall, there is a chance that the pollution could reach the ground at concentrations still high enough to put the plant in violation. By building very tall chimneys, the company ensures that by the time any of the pollutants reach the ground, they have been diluted sufficiently so that they don’t create a violation. If you look at the photo of the Mississippi Lime Co. Ste. Genevieve Plant, you can see that its chimneys are much shorter, and perhaps that is why I could smell the sulfur dioxide. In one sense, this is a good strategy: people and property in close proximity aren’t exposed to high concentrations of the pollutants. In another sense, it is a bad strategy: it puts pollutants into the environment, where they accumulate and cause widespread damage. Thus, pollution from facilities here in the Midwest contributes to smog, acid rain, mercury accumulation in fish, and GHG build-up in the atmosphere. Figure 7. The Labadie Energy Center Seen From Midtown St. Louis at Dusk on a Winter Day. Photo by John May. One final photo: Figure 7 is a photo of the Labadie Energy Center taken on a winter day from the top of a building opposite Forest Park in St. Louis. Expand the photo and you can see the chimneys on the horizon. The plant is some 30 miles away from the camera. The plume rises more than 2,000 feet into the air before the steam evaporates. How much higher than that does the column of polluted hot air rise? I don’t know, but I would expect quite a bit. 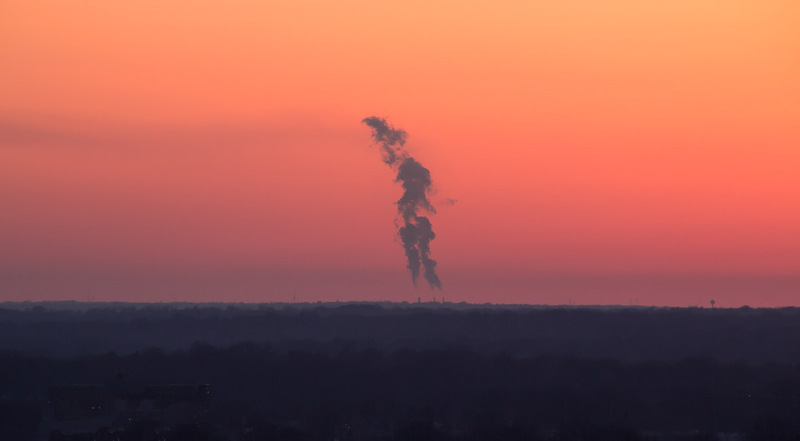 Even this visible plume dominates the otherwise empty sky and horizon. These plants come with important economic benefits, which I reviewed in the first post of this series, and we couldn’t do without them. But their pollution is also a big deal. So, the point is that you can’t necessarily see the pollution being emitted by a large industrial emitter. If the sun is in just the right spot, you might be able to barely make out some particulates. But the other pollutants are all invisible. On a cold day, the plant will emit billowing clouds of water vapor. Water vapor itself is mostly harmless, but it stands as a reminder of the invisible pollution hidden within. Environmental Protection Agency. TRI Explorer, Release Facility Report. Data accessed 12/21/2016 at https://iaspub.epa.gov/triexplorer/tri_release.facility. May, John. 2015. “Air Quality Update 2014.” Mogreenstats.com. Viewed online 12/21/2016 at https://mogreenstats.com/2015/11/06/air-quality-update-2014. Wikipedia. List of Tallest Buildings in Missouri. Viewed online 12/21/2016 at https://en.wikipedia.org/wiki/List_of_tallest_buildings_in_Missouri#Missouri.27s_tallest_structures. By mogreenstats in Air, Climate Change, Greenhouse Gas Emissions on 2017/02/02 .